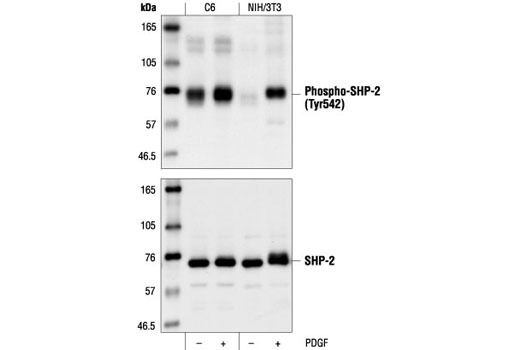 Phospho-SHP-2 (Tyr542) Antibody detects endogenous levels of SHP-2 only when phosphorylated at Tyr542. This antibody may cross-react with activated receptor tyrosine kinases. Polyclonal antibodies are produced by immunizing animals with a synthetic phosphopeptide corresponding to residues surrounding Tyr542 of human SHP-2 protein. Antibodies are purified by protein A and peptide affinity chromatography. SHP-2 (PTPN11) is a ubiquitously expressed, nonreceptor protein tyrosine phosphatase (PTP). It participates in signaling events downstream of receptors for growth factors, cytokines, hormones, antigens, and extracellular matrices in the control of cell growth, differentiation, migration, and death (1). Activation of SHP-2 and its association with Gab1 is critical for sustained Erk activation downstream of several growth factor receptors and cytokines (2). In addition to its role in Gab1-mediated Erk activation, SHP-2 attenuates EGF-dependent PI3 kinase activation by dephosphorylating Gab1 at p85 binding sites (3). SHP-2 becomes phosphorylated at Tyr542 and Tyr580 in its carboxy-terminus in response to growth factor receptor activation (4). These phosphorylation events are thought to relieve basal inhibition and stimulate SHP-2 tyrosine phosphatase activity (5). Mutations in the corresponding gene result in a pair of clinically similar disorders (Noonan syndrome and LEOPARD syndrome) that may result from abnormal MAPK regulation (6). Zhang, S.Q. et al. (2002) Mol Cell Biol 22, 4062-72. Edouard, T. et al. (2007) Cell Mol Life Sci 64, 1585-90.